That’s what fashion is about. 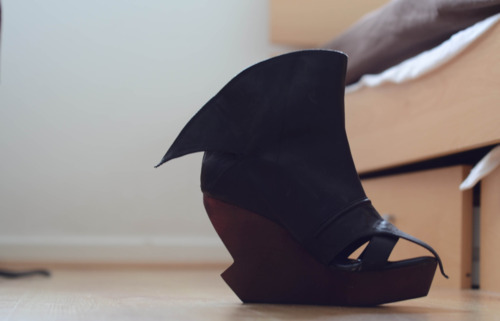 At the moment, I find the most exciting form of fashion architecture in heels of shoes. 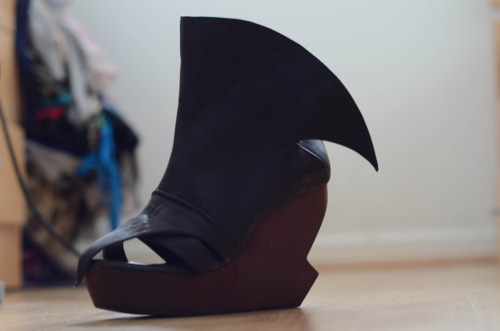 Last year was spent swooning over the innovative Finsk and Jeffrey Campbell designs - but that was the extent of it given they are excessively out of my spending league. Dreams really do come true, I found these wonderful things (below) in a small boutique in Hong Kong a few weeks ago and for much less than the RRP £500 as above. Drawn in by their architectural wooden heel, the sense of flight with the ankles winged in soft leather and the gladiator impression from the straps and points at the toe. That’s design, architecture and movement in a nutshell, my friend. These will also take me through this entire Autumn so 600 HKD (£46.80!!) well spent!